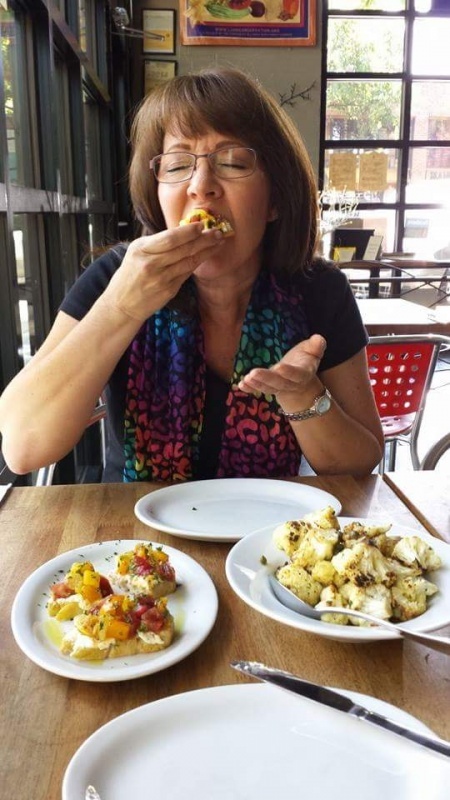 California Girl Comments: I am so excited, Ms. April wrote her first restaurant review. It is harder than it looks, and I am so proud that she got up her courage to review the restaurant Jane by herself. She did a great job! I have accompanied California Girl and The Brit on outings to critique local eateries. It’s always quite fun, and we taste each others food and break down the flavors and seasonings, as well as the quality of the service. I am certain that if I lived closer to them, we would go together often! California Girl comments: This is what I mean about it being harder than it looks: First of all, you have to think about every bite you eat, and what is in the dish. Then you have to think about plating, service, atmosphere and be able to write it all down. You can’t touch your food before the photos are taken, and sometimes that requires multiple shots and angles. If you have other diners with you, they also have to be patient and listen to you blather on about food tastes and textures and put up with you eating their food too. On occasion, I have shared my experience at a restaurant I have enjoyed and the first thing out of California Girls mouth is “did you critique it? Did you take pictures?” Alas, the answer is always “no,” and I feel like I totally missed the boat while just shoving my dinner in my pie hole. California Girl comments: lol pie hole? Well, I just happen to have a picture of Ms. April eating…. I love this photo! This week I had the occasion to spend a few days in San Francisco. 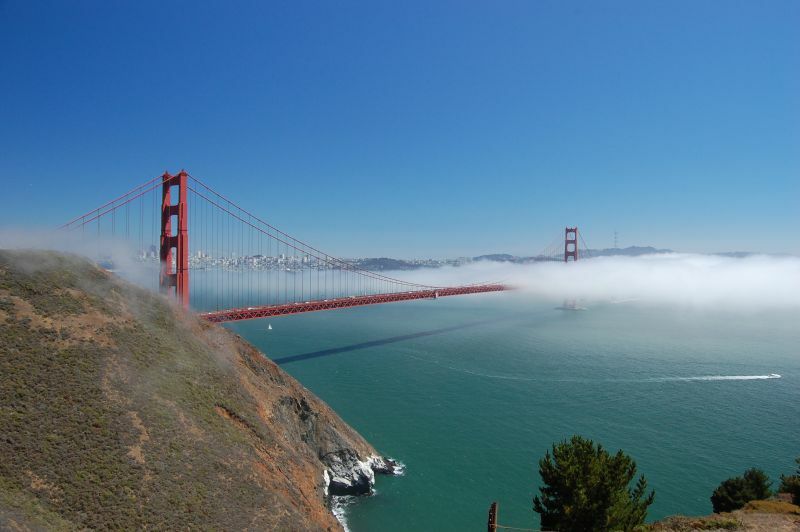 Now if you know anything about San Francisco, you know that mornings require a wrap or light jacket, because the fog rolls in off of the bay and will chill you to the bone. It was a mere 60 degrees with a light wind and damp fog, so we checked on Google for somewhere close enough to walk to as parking is always an issue in the city. 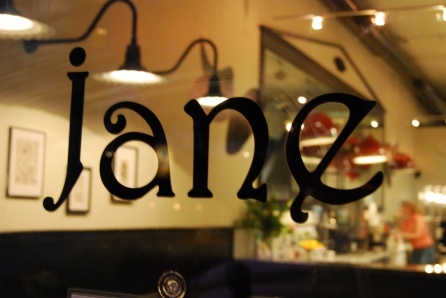 Google directed us to a little place called Jane in a narrow building sandwiched between other establishments. 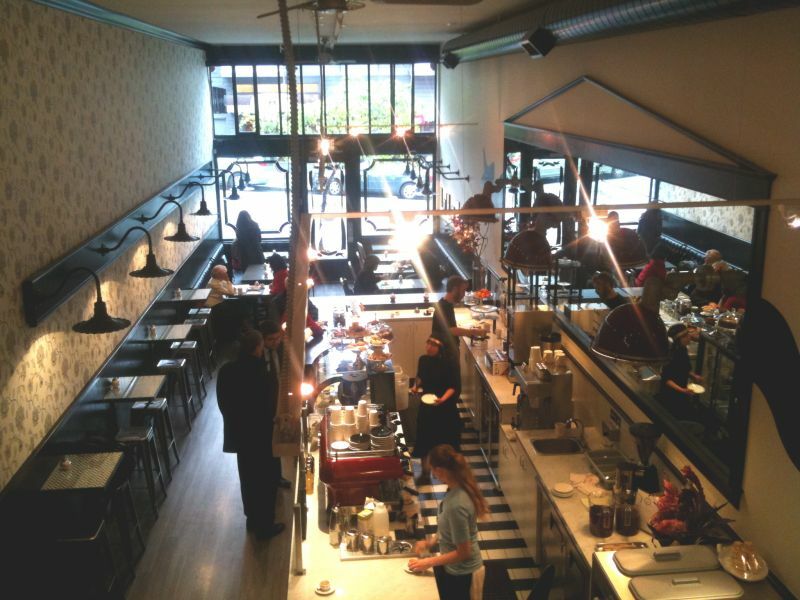 Located at 2123 Fillmore Street, Jane opened in February of 2011. The owner, Amanda Michael, started her establishment with the dream of serving delicious coffee, breakfast and lunch while maintaining strict standards of healthy, top quality ingredients and amazing flavor. That is a high bar – but Jane delivers. 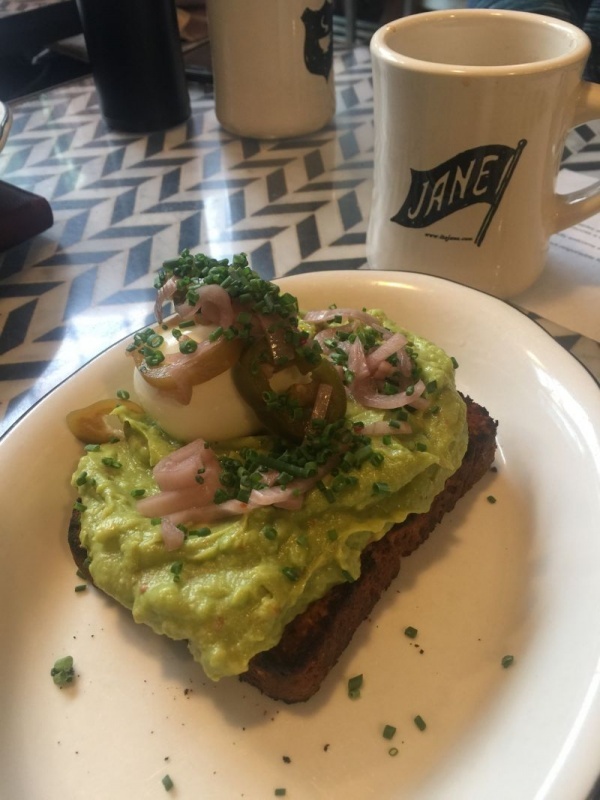 There is nothing pretentious when you walk in the door at Jane. At 7:30 in the morning it was already busy, and we were lucky to find a small table. Under the glass of the table tops is a typewritten note, that states that laptops and tablets are not allowed in the dining area prior to 4pm, and that if you need to use your electronic device, there is an area upstairs with electrical outlets and tables reserved for that. I love that this encourages patrons to interact, and enjoy their culinary experience, and I happily took notes with a pen and paper rather than my tablet. This restaurant is filled with locals, and it’s rather noisy ambiance speaks of patrons that enjoy the atmosphere and relationship they have with the staff. There is an open kitchen in the back, where you can sit and watch them prepare the food and interact with each other. It was like sitting at home and watching your mom cook your breakfast from the table. I liked the feel of that. There are no wait staff to take your order, and there was a constant short line at the counter to order your meal. Menu’s are printed on a cardstock paper and available at the counter. They are worn, and some of them stained, but it really fit the casual atmosphere of this establishment. We took our menu cards back to our table to make a selection, and I was amazed at the myriad choices of incredibly healthy dishes that were offered for breakfast. With a slice of homemade quiche starting at $5, and the most expensive item topping out at $14, there was a great array of selections to satisfy every palate. My friend, Kyla, requires gluten-free choices, and there were many offered, as well as vegan items for those that prefer that. We eventually made our selections and Kyla chose the Avocado Mash. This is described as avocado, cracked black pepper, smashed soft boiled egg, pickled shallot and jalapeno on house sourdough. They were happy to substitute a gluten free option for the sourdough for my friend at no extra charge. 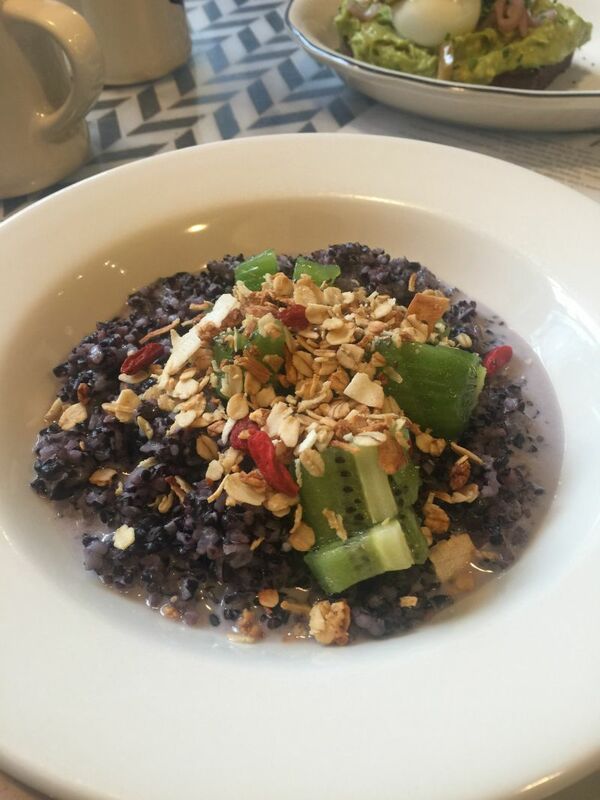 I chose the Raw Sprouted Black Rice Porridge, which was combined with almond and coconut milk, chia seeds, coconut crunch, dried goji berries and fresh kiwi. You can choose to have it served warm, and since I was still a bit chilled from the morning fog from the bay, I chose the heated version. I was not disappointed. Although you order at the counter, your meal is brought to your table when ready. When this dish arrived at our table, it was almost too pretty to eat. Kyla’s dish was more like a food sculpture, with the beautiful green of the avocado making a nest for the white and bright yellow of the perfectly cooked soft boiled egg. The thick slab of homemade gluten-free bread served as a delicious pedestal for this decadent breakfast. Kyla shared a bit of her dish with me, and I was so impressed with the avocado. I had expected sliced avocado, but this was more of a guacamole looking application, but without the Mexican flair we are so used to at patio get-togethers. The avocado flavor was fresh and velvety smooth, indicating a perfectly ripened piece of fruit, and was perfectly seasoned with just the right amount of acidity from the addition of citrus. The pickled shallots were not only beautiful, but a delightful contrast on the tongue to the smooth avocado mash. The addition of a few pieces of jalapeno slices were just enough of a surprise to delight the tongue and not overwhelm the dish with heat. The garnish was freshly chopped chives. It was truly delicious! When my choice arrived, I was surprised to find that blackened rice is actually purple. Yes, purple. My large portion was perfectly warm, not hot, so I was able to taste it immediately. It was truly beautiful, with the coconut crunch described on the menu being more of a coconut granola. The dried goji berries added a delightful splash of additional color along with the large chunks of fresh kiwi fruit. Having not even heard of “blackened rice” and being truly surprised by the beautiful purple color, I experienced a bit of trepidation as I lifted the first small spoonful to my mouth. The porridge was nicely warmed, delicately sweet and cooked perfectly with just a hint of firmness to the rice. My second spoonful was more eager, and I made sure I had a bit of the coconut crunch, berries and kiwi together with the porridge. All I can say is that it was truly a “party in my mouth.” This was by far the best breakfast dish I have ever had in my life, and I would gladly have had another bowl just to experience the remarkable combination of flavors again. Calfornia Girl comments: That looks far too healthy.. What an interesting combination! 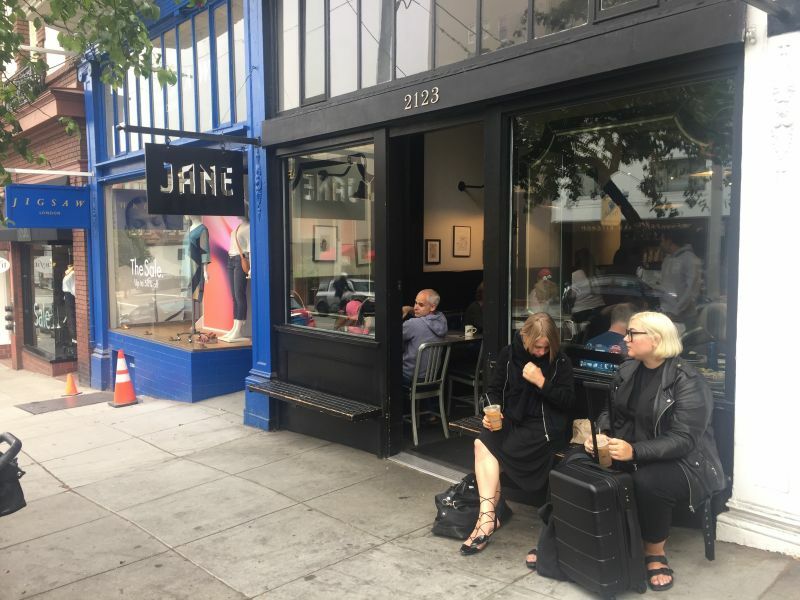 Jane was a true “find” and they have another location at 925 Larkin Street in San Francisco. Look them up at www.itsjane.com, as they have a bakery, catering options and online ordering! 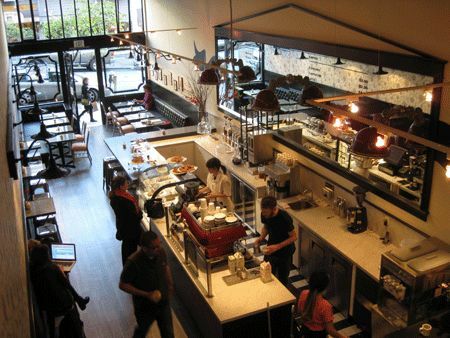 On my next trip to San Francisco, I am making a point of going to the second location and trying something new! I am already looking forward to trying some of their lunch selections.